Buttermilk, potato, and buckwheat. 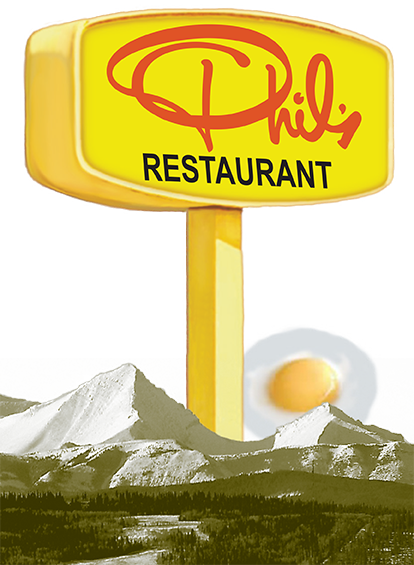 Made only from the freshest ingredients topped with whipped butter and Phil’s own specialty syrups. Crepes; filled, rolled and topped with your favorite fruit and whipped cream. The food you remember…that makes your feel good all over. Fish and Chips, Meatloaf, Liver & Onions, Salisbury Steak. Smaller portions for those with smaller appetites. “This Phil's is a favourite when we have the children. …a good range of breakfast and non-breakfast items for the whole family” Lauren H.
“We've been here for lunch, dinner and breakfast and the experience has always been good when the place is packed or empty” Lauren H.
“I am always impressed when I can get amazing service at horrendous times of the day. Critically, our server kept the coffee coming the entire time” Stefan W.
“Their service is top notch with experienced waitresses… that really know how to treat their customers” Terrence L.
“Great service, and tasty breakfast” Sara W.
“Can't go wrong if you're out for a hearty, massive breakfast after a long night.” Stefan W.
“A great place to go as a family or with friends (love the great selection of syrups for pancakes” Terrence L.
“Its ultra family friendly so there are lots of kids, grandparents, and friends here all the time” Koz T.